It's Disaster Preparedness Month! Stay Ready With a Healthy Heart - Cardiac Care & Safety, Inc. It's Disaster Preparedness Month! 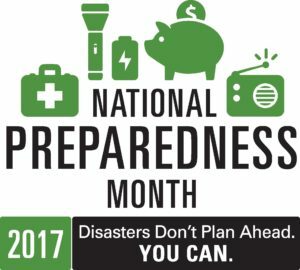 Stay Ready With a Healthy Heart - Cardiac Care & Safety, Inc.
September is National Preparedness Month, and 2017’s theme is “Disasters don’t plan ahead. You can.” At Cardiac Care & Safety, we agree with this philosophy. It’s important to stay prepared by keeping your heart healthy. Another good way to plan ahead for disaster is to make sure you’re able to identify the warning signs of a cardiac emergency. Keep reading to find our top tips for being ready to fight heart disease. Maintain a Healthy Weight: When you are at a healthy weight, your body can do a better job circulating your blood and maintaining your fluid levels. It also reduces your risk of heart disease. If you are overweight, work out a weight-loss plan with your doctor. Make Healthy Diet Choices: Your diet plays a huge role in your heart health. This means eating a rainbow of fruits and veggies every day, avoiding high glycemic foods, and cutting down on animal products. Check out our past post for more information. Exercise Regularly: Mortality rates in those who don’t exercise are nearly double that of those who do. Your heart is a muscle, and exercise can strengthen it. Exercise lowers bad cholesterol, boosts your good cholesterol, and lowers blood pressure. Make Sure You Can Recognize When Emergency Medical Assistance is Needed: These include; chest discomfort, shortness of breath, cold sweat, nausea, or lightheadedness, warning signs of heart attack; face drooping, arm weakness, and speech difficulty, warning signs of stroke; sudden loss of responsiveness and no normal breathing, warning signs of cardiac arrest. Make Sure You are CPR Certified: If CPR is performed within the first few minutes of cardiac arrest, a person’s chance of survival can double. Cardiac Care & Safety hopes these tips help keep you safe and ready to fight heart disease.